I run errands. A lot of them. Before I had kids and when I worked a regular shift (instead of this 24/7 mom thing), I totally did my errands in about an hour on the weekends. Now, it’s like 6 hours in and I still have 8 stores to go to. Better yet, let’s throw-in lunch. And a snack. Oh, and a potty break for my little potty-trainer. I need to be a mom with a plan. 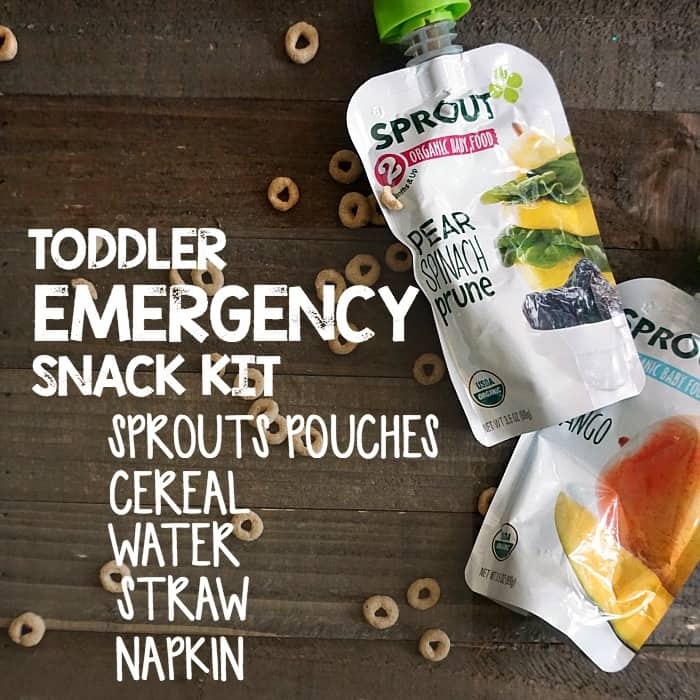 And this one hack…oh, this Toddler Emergency Snack Kit makes all the difference in my day. This Ninja-Level Mom Hack has become a serious necessity for us in the last few months, since we found out my youngest is severely allergic to dairy. We just can’t trust drive-thru restaurants to not accidentally put cheese on a burger–or that there won’t be milk in the battering of fries. But, my #1 tool in my Toddler Emergency Snack Kit? Sprout’s. There’s an honest promise that I can’t deny makes me a little giddy as a mom with a serious label-reading obsession. So What’s In My Toddler Emergency Snack Kit? Breakfast Cereal–just a few bites in a plastic baggie and we’re set for a crunchy snack in seconds. Bottled Water–no meal is complete without a drink and water’s the best, after all. Napkin–forgot that ONE time. Oops. I take our Toddler Emergency Snack Kit everywhere with us–the zoo, errands, grandma’s house. Literally everywhere. That’s why it only has things in it that travel well–it goes anywhere. And, with Sprout, I know exactly what I’m feeding my babies. All I have to do is look at the front of the pouch–just flip one over and see–the ingredients on the front are the same as what’s really in the pouch. 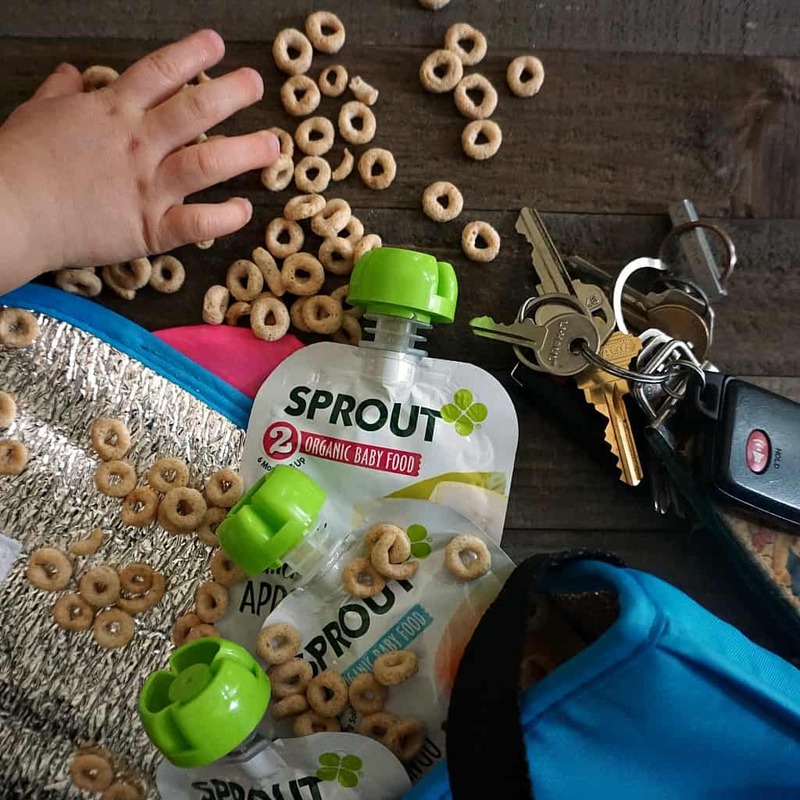 Actually, not only are the Sprout pouches my go-to for our Toddler Emergency Snack Kit, we also use them as non-emergency meals at home and appetizers…snacks…pretty much anything when the kids need something quick, easy and non-messy. 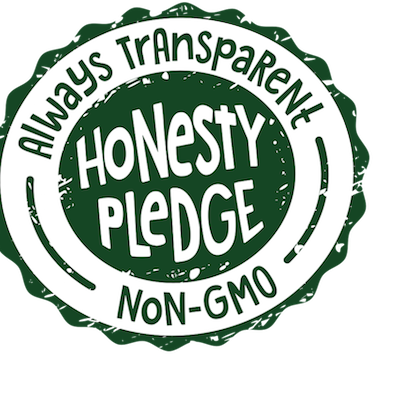 Their “Keep it Honest, Make it Real” pledge…that Just. Makes. Me. Happy. And I know that Sprout is onto something awesome. Seriously, research shows that developing a love of healthy foods early on helps foster healthy eating habits for life. That’s why Sprout is committed to providing the best nutrition and uses only certified-organic, non-GMO ingredients like whole fruits, vegetables and grains. 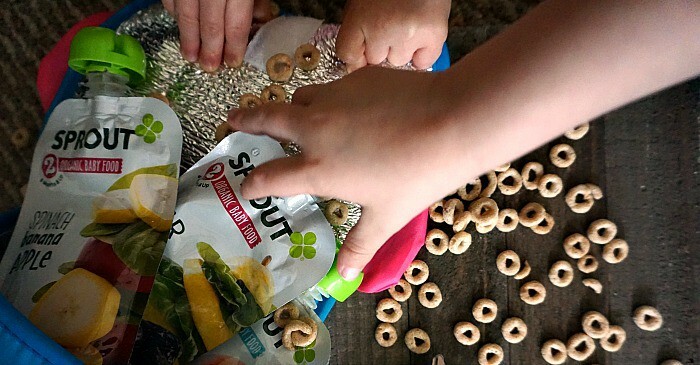 And, because Sprout uses only whole fruits, veggies and grains with no concentrates or preservatives (and has no GMO ingredients)–exactly like what you’d find in your kitchen, I feel like my kids get more wholesome foods–with flavors they love. Check out their Mission & Values to see for yourself. Do you have any Ninja-Level Mom Hacks? Just drop me a line–let me know if there’s anything else you’d include in our Toddler Emergency Snack Kit! 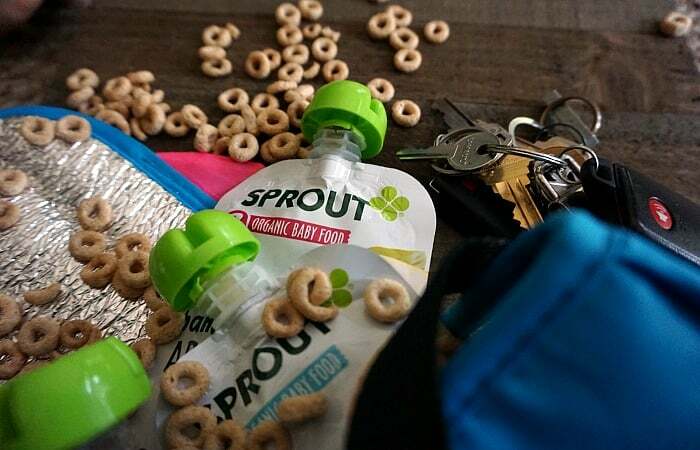 I’m so excited that these Sprout Pouches are now available at my local Target in Dallas–but you can find out Where to Buy your new Sprout pouch flavors: Mango, Spinach Banana Apple, Blueberry Banana Oatmeal, and Pear Spinach Prune (which are all very yummy–I taste them all before handing them to my kids, heh). Try out the new Sprout Pouch flavors for yourself and save by downloading this Buy 1 Get 1 FREE Sprout Coupon today!